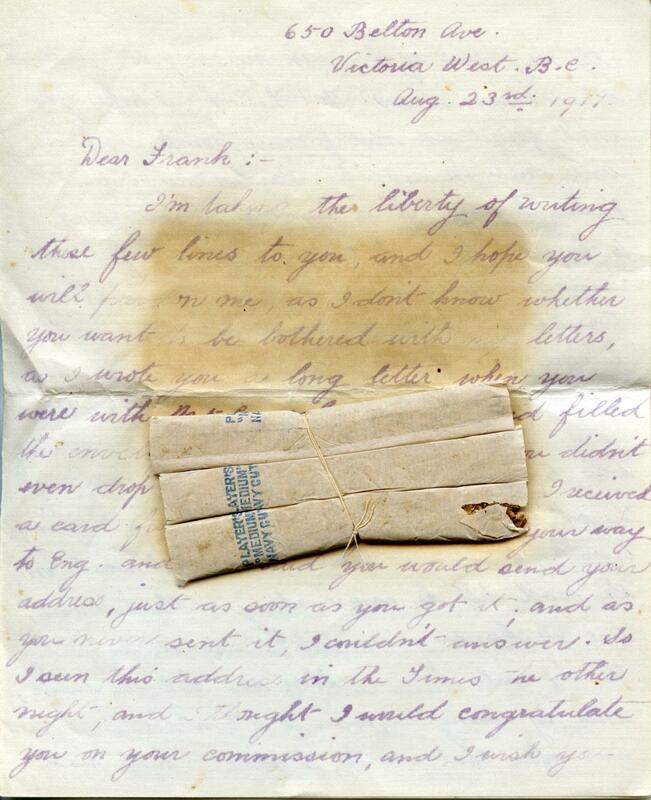 The Player’s Navy Cut cigarettes carefully sewn by Frieda Hasenfratz into her letter to Frank Dunn never reached the young Second Lieutenant of the Durham Light Infantry. Exactly one month after she penned her note, congratulating him on his recent commission in the Imperial Forces, he was killed by a shell while leading a patrol in No-Man’s Land. Her closing words wished him “God’s speed back to B.C.” but sadly it wasn’t to be. Frank Mewborne Dunn was born in Toronto, Ontario on June 23, 1890 but moved with his family to the west coast in the following year. Frank grew up and attended school in Victoria, British Columbia where his father Robert Bradford Dunn became editor of The Victoria Times. Frank followed in his father’s footsteps becoming a reporter then Sports Editor with both The Victoria Times and The Daily Colonist. In June 1915 Frank enlisted with the Canadian Expeditionary Force as Private #521044 and joined the No. 5 Overseas General Hospital. 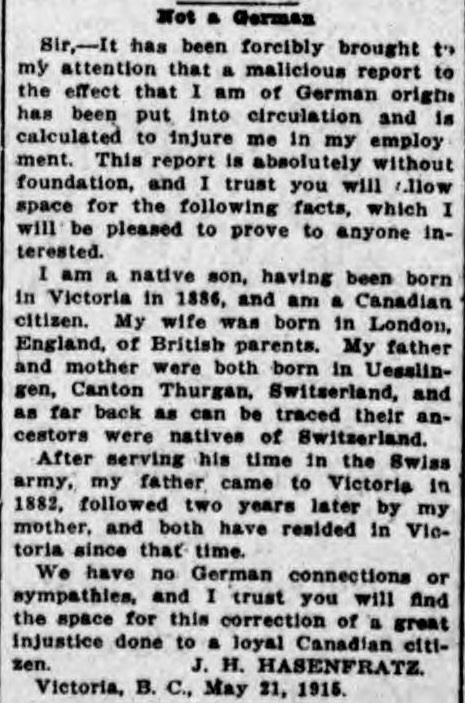 He spent nearly 18 months in Salonika, Greece and in 1916 The Daily Colonist printed a letter from Frank under the title “Victoria Unit at Salonica is Busy” (June 27th, 1916). In it he described the growth of the camp and the spectacular thunder and lightening storms they had experienced since arriving. Frank also wrote a wonderful letter (included in the gallery below) to Frieda that same summer in which he described being awoken to the sound of her name but being sorely disappointed to discover the figure of Private Cupitt, rather than herself, standing in the doorway of his tent. Frank ends the letter with an intriguing question to Frieda: “There is one thing that is bothering me Frieda. You remember when we left Victoria. If you had had the chance at the boat would you?”. Victoria-born Frieda Louise Hasenfratz was the daughter of Jacob Hasenfratz, a Swiss born local brewer. Despite being Canadian-born it couldn’t have been easy for Frieda and her family with their Germanic sounding surname. At one point her brother Hermann was forced to write to the local paper reminding Victorians that he was “Not a German“. 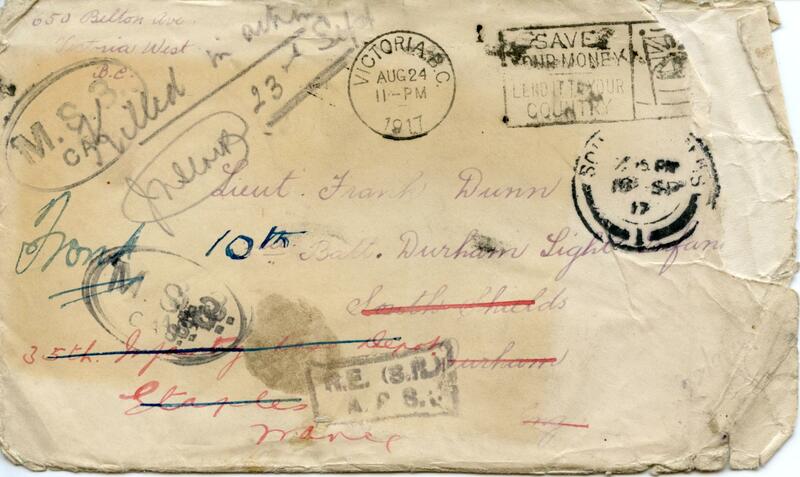 In the spring of 1917 Frank travelled to England where he trained for the Royal Flying Corps. Despite passing he chose instead to attend an officer’s training school and in August was granted a commission in the Durham Light Infantry. Two days after the news of his commission appeared in local paper Frieda wrote her final letter to Frank. 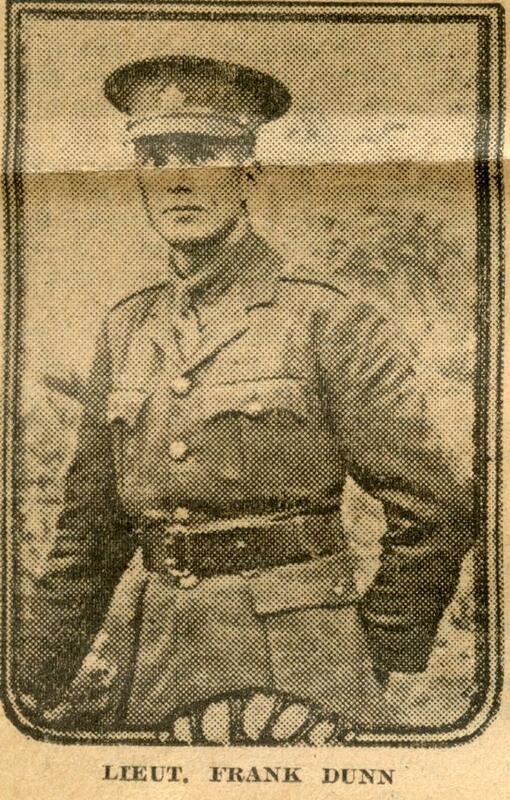 Before it arrived in South Shields Frank had departed for France where he was to join the 10th Battalion DLI. It was during his first and only tour of duty in the frontline trenches near Ypres that he was fatally wounded. He is buried at Cabin Hill Cemetery in Belgium. On Nov. 20th, 1917 the Dead Letter Branch of the Post Office in Ottawa postmarked Frieda’s letter before returning it to her in Victoria. Although the letter’s contents remained intact its cover told the sad tale of its long journey from the Pacific coast of North America to the Western Front and back. Frieda never married and remained in Victoria until her death in 1956.